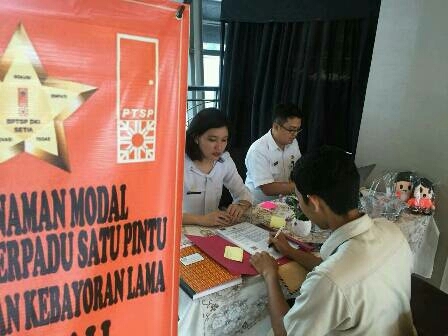 " This time we are present at two locations after seeing the previous high enthusiasm of the public on PTSP Goes to Mall"
Jakarta Investment and One-Stop Integrated Service (DPM and PTSP) Dept. once again opens PTSP Goes to Mall. This time, the service will be opened at two shopping centers in the capital. Jakarta DPM and PTSP Dept. Head, Edy Junaedi Harahap said people' enthusiasm for the service is quite high. The service also effectively encourages people to process their own licensing and non-licensing without using a third party. "This time we are present at two locations after seeing the previous high enthusiasm of the public on PTSP Goes to Mall," he expressed, Friday (9/29). Both locations opened are held at Pondok Indah Mall 2 (PIM 2) Skywalk, every Wednesday at 11 AM-3 PM, from September 27-end of October 2017. Then there is also Koja Trade Mall on the first floor on Thursday on September 28. He hoped, through the service, the public need for excellent public services could be fulfilled. It is in accordance with the provisions of Law No. 25/2009 on Public Service. "We want to invite Jakarta people, that public service is a basic necessity and civil rights of every citizen," he disclosed.